Home » All Products » » Want to support recycling? Buy more products made from recycled materials. Want to support recycling? Buy more products made from recycled materials. Recycling contamination continues to be a problem in America. For years, China has been the biggest importer of U.S. recyclables but last year China, fed up with contaminated recyclables, banned the import of 24 varieties of solid waste. This includes types of plastic and unsorted paper commonly sent from the U.S. Municipalities are currently struggling, faced with overflowing recycling centers and are requesting they may be allowed to send recyclable paper and plastic to landfills. What can individuals do to make sure products we put in the recycling bin actually get recycled? Commit to buying more products made from recycled materials, helping to recreate a market for recyclables. At Eco Promotional Products, one of our main goals is reducing waste. While we encourage customers to reduce and reuse as much as possible, there are some single use products many of us will never be able to completely do away with, namely household goods like toilet paper, facial tissues garbage bags and aluminum foil. Choosing recycled versions of these products won’t help with waste reduction, but it does help with reduced emissions of greenhouse gases that come with creating virgin materials. In addition to common household products, there are many recycled options for apparel and accessories from some of the biggest brands like Puma, The North Face, Adidas and Patagonia. Fashion designer Stella McCartney is spearheading sustainability in the fashion world. She has collaborated with Adidas on a recycled line using eco-friendly fabrics such as recycled polyester, organic cotton, and recycled ocean plastic. In September, Adidas launched a leather-free, vegan edition of its classic Stan Smith shoe designed by McCartney. Even McCartney’s best-selling high-fashion Falabella bag is made from vegetarian leather and recycled plastic bottles. The designer also recently partnered with Parley for the Oceans to create a limited edition Falabella GO backpack made from recycled ocean plastic. Upcycling and recycled materials are commonly found in home décor and there are even recycled building materials like Trex® outdoor patio furniture and decking and recycled roof tiles. 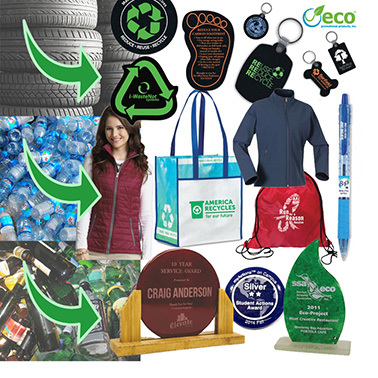 Eco Promotional Products offers a number of recycled promotional products made from post-consumer content like apparel, bags, recycled paper products, recycled tire products and pens made from recycled water bottles. We also offer Liberty Bottles which are made in the USA from recycled aluminum at a zero-waste manufacturing facility. With recycling in jeopardy, buying recycled products will play a vital role in saving recycling in the U.S. Many organizations are committed to buying recycled promotional products. For example; T-shirt or bag designs highlighting the recycled nature of the products by adding such phrases as “I used to be a plastic bottle” to their labels or hangtags are sought after just as much as the product itself. Let Eco Promotional Products help you choose the perfect recycled promotional product for your next event or outreach campaign.